While the African American unemployment rate is at or below its prerecession level in 14 states (of the 22 states and the District of Columbia for which these data are available), in 15 states and the District of Columbia, African American unemployment rates exceed white unemployment rates by a ratio of 2-to-1 or higher. The District of Columbia has a black-white unemployment rate ratio of 6.7-to-1, while Indiana and Louisiana have the highest ratios (2.6-to-1) among the states. The highest African American unemployment rate is in the District of Columbia (12.8 percent) followed by Louisiana (9.7 percent). The highest Latino state unemployment rate is in Connecticut (8.9 percent). In contrast, the highest white state unemployment rate is 5.0 percent, in New Mexico. While the Hispanic unemployment rate is at or below its prerecession level in nine states (of the 16 states for which these data are available), Colorado was the only state where the Hispanic unemployment rate was lower than the white unemployment rate. In three states, Hispanic unemployment rates exceed white unemployment rates by a ratio of 2-to-1 or higher (Massachusetts, 2.3-to-1; Connecticut, 2.1-to-1, and Pennsylvania, 2.0-to-1). In June 2017, the national unemployment rate was 4.4 percent, a slight decrease from 4.5 percent at the end of the first quarter of this year.2 State unemployment rates in June ranged from a low of 2.3 percent in Colorado and North Dakota to 6.8 percent in Alaska.3 According to a previous EPI analysis of unemployment by state, from March to June 2017, 33 states saw their unemployment rates decline, 15 states and the District of Columbia saw unemployment rates rise, and two states saw no change. EPI analyzes state unemployment rates by race and ethnicity, and racial unemployment rate gaps, on a quarterly basis to generate a sample size large enough to create reliable estimates of unemployment rates by race at the state level. We only report estimates for states for which the sample size of these subgroups is large enough to create an accurate estimate. 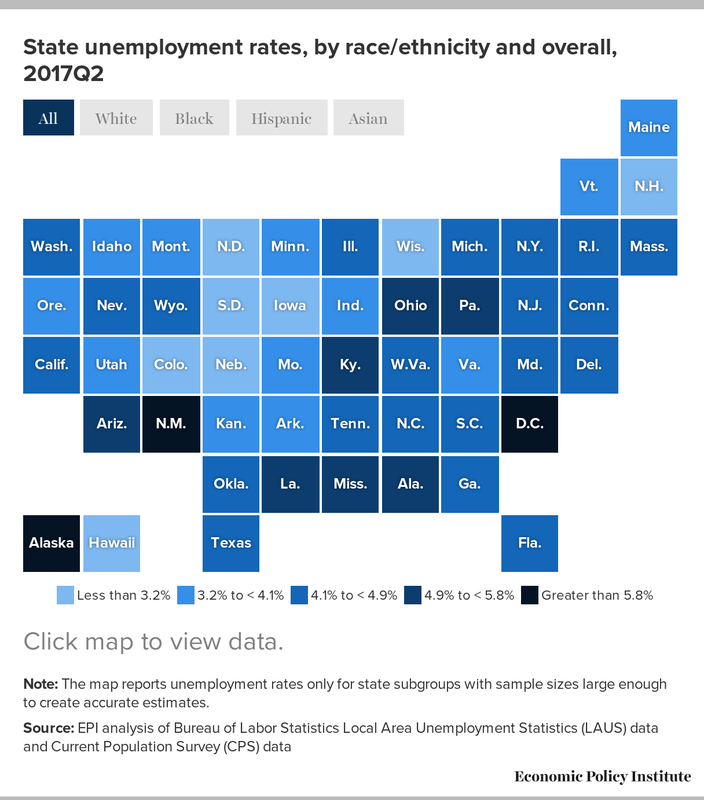 For this reason, the number of states included in our map and data tables varies based on the analysis performed (unemployment rate, change in unemployment rate since the fourth quarter of 2007, and ratio of African American or Hispanic unemployment rate to white unemployment rate). In the second quarter of 2017, the white unemployment rate was lowest in South Dakota (1.5 percent) and highest in New Mexico (5.0 percent), as shown in the interactive map and underlying data table, which present state unemployment rates by race and ethnicity. South Dakota has had the lowest white unemployment rate for eight consecutive quarters, and New Mexico has had the highest white unemployment rate for two consecutive quarters. Table 1 displays changes in state unemployment rates by race and ethnicity from the fourth quarter of 2007 to the second quarter of 2017. The white unemployment rate remained most elevated above its prerecession level in New Mexico: 1.7 percentage points higher than it was in the fourth quarter of 2007. The white unemployment rate is at or below its prerecession level in 36 states, up from 30 states in the first quarter of 2017. The largest declines in white unemployment since the end of 2007 have occurred in Michigan (down 2.6 percentage points), Oregon (down 2.4 percentage points), Maine (down 1.9 percentage points), and Wisconsin (down 1.9 percentage points). The white unemployment rate is above but within 0.5 percentage points of its prerecession level in 11 states and the District of Columbia. African American unemployment rate estimates are available for 22 states and the District of Columbia. During the second quarter of 2017, among states, the African American unemployment rate was lowest in Arkansas (5.6 percent) and highest in Louisiana (9.7 percent); in the District of Columbia, it was 12.8 percent. The District of Columbia also had the highest black unemployment rate during the previous two quarters, though among states Tennessee had the highest black unemployment rate in the first quarter of 2017. In the second quarter of 2017, of the 22 states with African American estimates every state had African American unemployment rates below 10 percent; in 12 of these states, the rate was lower than the second quarter national average for African Americans (7.4 percent). As shown in Table 2, which displays the black-white and Hispanic-white unemployment rate ratios in the second quarter of 2017, California, Missouri, and North Carolina had the smallest black-white rate gaps of the 22 states and the District of Columbia. In those states, black unemployment was 1.6 times the white rate. Delaware had the smallest black-white unemployment rate ratio at the beginning of the year (1.4-to-1). In the second quarter of 2017, as in the previous three quarters, the largest gap was in the District of Columbia, where the black unemployment rate was 6.7 times the white rate. The next highest unemployment ratios were in Indiana (2.6-to-1) and Louisiana (2.6-to-1). The black unemployment rate in the second quarter of 2017 was at or below its prerecession level in 14 states: Arkansas, California, Illinois, Indiana, Michigan, Mississippi, Missouri, New Jersey, New York, North Carolina, Ohio, South Carolina, Tennessee, and Texas. This is an increase from the 11 states that had reached this benchmark by the first quarter of 2017. However, with the exception of Texas, all of these states had black unemployment rates of at least 8.0 percent before the recession. Of the states in which black unemployment rates have recovered, four have black unemployment rates higher than the second quarter national average for African Americans (7.4 percent): Illinois, Ohio, Tennessee, and Texas. The black unemployment rate remains most elevated above its prerecession level in Delaware (3.6 percentage points higher). Hispanic unemployment rate estimates are available for 23 states and the District of Columbia, and data on the change in Hispanic unemployment rates since the fourth quarter of 2007 are available for 16 states. In the second quarter of 2017, the Hispanic unemployment rate was highest in Connecticut (8.9 percent) and lowest in Colorado (1.9 percent). Connecticut replaced Pennsylvania as the state with the highest Hispanic unemployment rate, and Connecticut and Pennsylvania were the only states with Hispanic unemployment rates above 8.0 percent in the second quarter. Among states, Colorado also had the lowest Hispanic unemployment rate in the previous quarter. The Hispanic unemployment rate is at or below is prerecession level in nine states: California, Colorado, Florida, Georgia, Illinois, Nevada, New York, North Carolina, and Washington. The Hispanic unemployment rate is above but within 0.5 percentage points of its prerecession level in Arizona, New Jersey, and Utah. The Hispanic unemployment rate was most elevated above its prerecession level in New Mexico (1.8 percentage points). Colorado was the only state where the Hispanic unemployment rate was lower than the white unemployment rate (with a Hispanic-white unemployment rate ratio of 0.8-to-1). This is the second consecutive quarter Colorado had a Hispanic-white unemployment ratio of less than one. The ratio of Hispanic unemployment to white unemployment was highest in Massachusetts (2.3-to-1), followed by Connecticut (2.1-to-1) and Pennsylvania (2.0-to-1). Asian unemployment rate estimates are available for 11 states and data on the change in Asian unemployment rates since the fourth quarter of 2007 are available for eight states. The Asian unemployment rate was lowest in Massachusetts (2.1 percent) and highest in Washington (4.5 percent). Massachusetts has had the lowest Asian unemployment rate for two consecutive quarters. The Asian unemployment rate was below 5 percent in every state for which estimates are available. The Asian unemployment rate was at or below its prerecession level in California, Hawaii, Nevada, New York, and Texas. In Illinois, it was above but within 0.5 percentage points of its prerecession level. The Asian unemployment rate was most elevated above its prerecession level in New Jersey (1.2 percentage points higher). 2. “Labor Force Statistics from the Current Population Survey: Unemployment Rate,” Series Id. LNS14000000 [online data table], U.S. Bureau of Labor Statistics, August 28, 2017. 3. “State Employment and Unemployment—June 2017” [news release], U.S. Bureau of Labor Statistics, July 21, 2017.